author Barbuy, B.; Ortolani, S.; Bica, E.; Desidera, S.
Discovered by William Herschel on May 21, 1784. This globular cluster was first taken for a bright nebula by W. Herschel, and cataloged accordingly as H I.44. John Herschel also described it as a nebula, as he apparently couldn't resolve it into stars either. In 1977, Peterson announced the finding of another planetary nebula in the neighborhood, and perhaps associated with globular cluster NGC 6401 in Ophiuchus; this planetary nebula candidate was cataloged as Peterson 1 (Pt 1; PK 004+03.1). 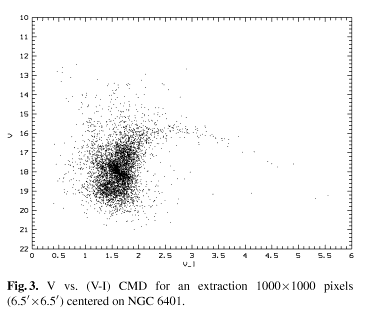 However, in 1990 Acker and Stenholm found that this object exhibits a red stellar continuum - thus is not a planetary nebula but a symbiotic star. Barbuy, B.; Ortolani, S.; Bica, E.; Desidera, S.